Hey Fam! 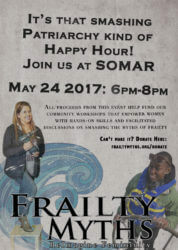 Join us for our first fundraiser in May 24th at SOMAR! It’s gonna be a great party and we’ll be raisin money so we can host more workshops and smash myths of frailty in the Bay Area and around the country! We’ll be auctioning off great prices and holding a raffle for all sorts of goodies like Tshirts, books, tote bags, and more. This entry was posted in Uncategorized and tagged empowerment, frialty myths, fundraiser, happy hour, smash patriarchy, somar, women. Bookmark the permalink.